According to preliminary findings from a market survey conducted by Environment Analyst, environmental consulting business managers reported average revenue growth of 2.6% for their businesses in 2016. Participants from larger environmental consulting firms provided an average response of some 5.3%, up from the slight decline in the same survey conducted last year. Revenue – average, unweighted global EC revenue growth for 2016 is stated at 5.3% for large firms, and 1.2% for small and medium-sized firms (with EC revenues less than than $15m/£10m/€13m). Staff – the mean, unweighted increase in international environmental consultancy teams comes in at 3.4% for large firms, and 1.8% for small/medium practices. 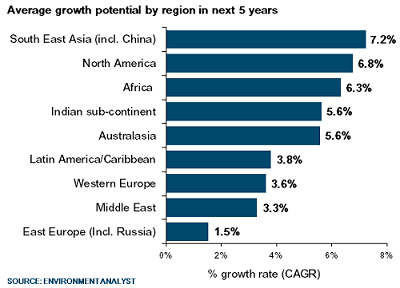 Regions – in terms of five-year regional growth prospects, South East Asia & China is currently topping the list of regions (with an unweighted mean CAGR of 7.2%) followed by North America (6.8%). On Western Europe, consultants are less bullish about their prospects with mean forecast CAGR of 3.6%. Services – these interim global market findings suggest that currently the highest growth is being seen in air quality services (7.8%, on average), followed by water quality & resource management (7.1%) and environmental management and compliance (6.9%). Clients – currently the highest growth is being seen in the transport sector (9.9%, on average), followed by renewable energy and chemical & pharmaceutical (both 8.2%). Forecasts – in this interim survey, the general consensus of expectations for the future remains healthy, with annual growth in global EC revenue expected to rise year-on-year from 3.1% in 2016 to 4.5% in 2017 and further to 6.3% in 2018.